How do you feel about your body? The way you see yourself greatly influences your your your ability to change for the better, not to mention your self-esteem and emotional health. If you want to loose weight, never underestimate the importance of your body image! This guided meditation for weight loss course will help you re-program your body image, AND re-program your eating decisions, for lasting results. The many small choices we make every day determine our future. This program is about helping you connect inside to the place where good decisions and positive choices are made; small choices that over time produce big results. Because we’re separated from consequences by time , it’s easy to delude ourselves into thinking what we eat in this moment isn’t so important. “Enjoy this now, and the future will take care of itself.” Denial comes easily when faced with immediate gratification, so we continue eat the wrong foods, or eat too much, often immediately followed by feelings of shame, failure, and frustration. Fortunately, we’re each equipped with powerful inner resources that can be drawn upon to overcome difficult habits. Using the guided meditation in this program you’ll learn to tap those resources, override negative eating habits and establish new, healthy ones. When we change from the inside out, we have a much greater chance of success, and that’s what makes this program so effective. Guided meditation for weight loss IS effective, and research has backed it up. Guided imagery can help you train your mind to notice habitual patterns you want to break and reduce cravings or binge eating. This program also uses visualization to help you succeed. Imagining yourself the way YOU want to be can help you stay motivated and reach your goals. Get the support you need today to reprogram your bad habits and transform yourself from within! How do you feel about your body? The way you see yourself, and your attitude about your body, greatly influences your self esteem, your emotional well being, and even your physical health. If you’re interested in improving your health, recovering from illness, losing weight, or becoming more fit, never underestimate the importance of building self esteem and a positive body image. And if you struggle with an eating disorder, you’ll want to pay especially careful attention to this issue. In this gentle guided meditation for overcoming body image issues by Max Highstein, voice artist Kitzie Stern guides you on a journey to a lovely, secluded setting, full of healing energy. There you’ll have the opportunity to view your body with objectivity and neutrality, be at peace with yourself, and see your own body — and yourself — with compassion and appreciation. You’ll let go of negative messages you may have repeated to yourself over time, and affirm new, positive ones. And you’ll have time to listen to what your body has to tell you about your next steps. 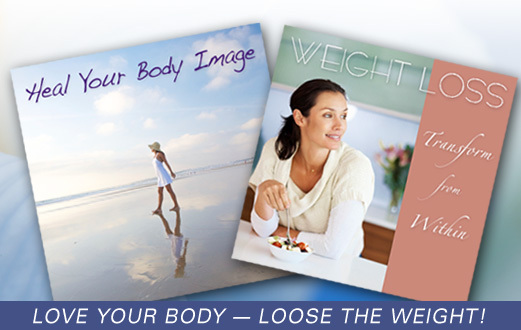 Overcome body image issues today and put yourself on a path to a better life. Take control of how you view yourself and learn to let go! 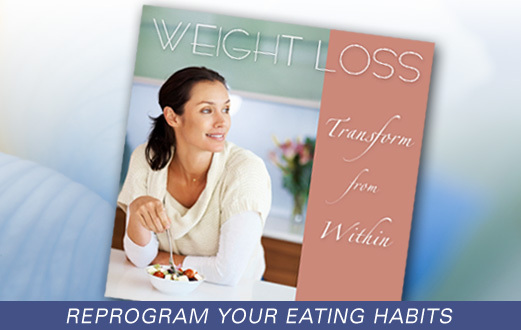 "Weight Loss: Transform From Within has helped me pinpoint how I've been mishandling my emotions through eating. It's not easy changing a behavior like eating, but your program has made a difference and I plan to continue using it daily to make a long term change." Customer testimonial. Name withheld for privacy. "Today, it’s virtually impossible to avoid the media's relentless procession of idealized bodies. But here in reality people come in all shapes, sizes and colors. Looking good is one thing, but being obsessed with having a body that matches what’s on TV is insanity! Unfortunately, it also leads to lots of misery, disappointment, and low self esteem, and contributes to eating disorders and unhealthy diets. "Some things about our bodies are possible to change, and some are not. Whether you’re planning to change your appearance, or know you’ll be living with it as is, learning to accept and love your body in its present form can be one of the healthiest and most helpful steps you can take. "I wrote this program to help us make peace with our bodies, and to let go of all the old programming we’ve been fed from early on, right up to the present day. Programming that says 'If I don’t look a certain way, I don’t matter'. That’s something none of us need to carry around with us. "Somewhere there’s a plastic surgeon who hopes you won’t use this guided meditation, because it may just cut into the next payment on his third home. Poor guy! 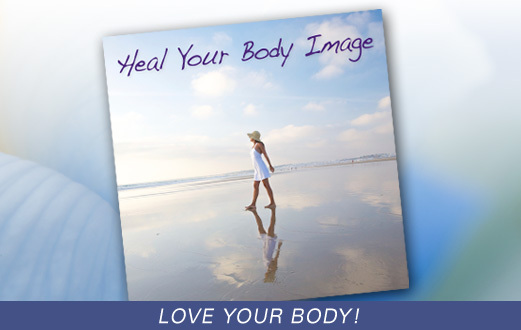 I hope you’ll use Heal Your Body Image to change your life, from the inside out."